With freezing, wintry days ahead for many of us, the thought of braving the elements to get to the gym or go for a run does not sound very engaging. Maintaining the motivation to adhere to your weight loss goals when the rest of the world wants to hibernate is simple with hypnosis for weight loss. Many us who want to get back into shape agree that motivation is especially challenging when the weather changes, so what if you could stay dedicated to your diet and exercise plan just by viewing a hypnotherapy weight loss DVD or listening to a CD? Better yet, a hypnotherapy weight loss program can ease your compulsions too. Self-hypnosis for weight loss works simply, but effectively, by leading you to a deeply relaxed state where your unconscious can more effortlessly accept post-hypnotic suggestions, like the ones that will keep you motivated to keep on your fitness track, even in the middle of winter. It is a known fact that if a person exercises, it will speed up his/her metabolism and boost the rate that weight is dropped. Some of the most successful hypnosis exercise motivation techniques comes from Neuro-Linguistic Programming, or NLP. With NLP, the unconscious is programmed to use the same thought processes that are initiating a problem, to get rid of it. Said another way, the same thought processes that the unconscious utilizes to create oral compulsions and cravings could help to completely stop them! And similarly, the same processes can be used to increase your motivation to exercise. Anchoring is an NLP method that can be used to give you a “switch” for activating feelings and behaviors. Creating an appetite hypnosis anchor works simply and effectively like this: A qualified hypnotherapy weight loss practitioner will safely direct you into a tranquil hypnotic state. Then the hypnotherapist will ask you to identify a time when you were excited and happy about anything in your life. The point of this exercise is to remember and re-experience as many sensations as possible from numerous times in your life when you felt motivated and eager to do anything at all. Then, the hypnotherapist will ask you to anchor those feelings by simply touching two fingers together. Next, you will be asked to visualize yourself exercising and enjoying it. As you produce this mental picture, you’ll trigger your anchor by touching those two fingers together again. When you complete this action, your unconscious will connect the feeling of excitement and eagerness from the other memory to the thought of exercising. From this point on, any time you need to feel motivated to exercise, you can simply trigger your anchor and re-experience those same affirmative feelings that will motivate you to workout. NLP and weight loss hypnosis can even be used to dissuade behaviors, so you can easily overcome cravings. That sounds much easier and encouraging than beating yourself up for missing a workout or giving into temptation, doesn’t it? A successful weight loss hypnosis program will also address the root cause of weight gain for many people, namely a lack of self-esteem. In a relaxed state, you can be given post-hypnotic suggestions that will develop your self-esteem as you lose more weight. The lack of self-esteem is a big reason for being overweight. A lot of people wonder if, after trying every new diet and purchasing every piece of exercise equipment on the market, something as straight forward as weight loss hypnosis can help them. The good news is that research shows that all normal people are hypnotizable to a greater or lesser extent. However, it should be noted that people who have less than a 70 I.Q. or those who are in an active state of psychosis or with senility generally are not hypnotizable. But for the rest of us, hypnotherapy for weight loss can actually help us look forward to eating healthily and working out. That said, the key proponent for victory in any fitness routine, whether it incorporates weight loss hypnosis or not, is wanting to attain your weight loss goals. On a related note, that is exactly why you can not force someone to undergo weight loss hypnotherapy just by giving them suggestions. If someone is against an idea, no amount of weight loss hypnosis they hear or see will take hold. Looking to the NLP explanation above, if someone does not posses a memory of feeling motivated or positive, they can still be successful with hypnotherapy and NLP because they can envision what it would feel like if they did feel that way, and anchor those imagined feelings. So, if you are like many of us and find your drive dwindling as the temperatures drop and the days get darker, weight loss hypnosis can help regain (or maintain) your passion for carrying out and finally achieving your fitness goals. Alan B. Densky, CH is a pioneer in the use of Video weight loss hypnosis. His Neuro-VISION technology was awarded a US Patent because of its effectiveness. He offers several powerful appetite suppression hypnotherapy programs. Visit for free hypnotherapy resources & downloads. This is a common question that I get, and it is one of the more common misconceptions and myths surrounding hypnosis. It’s interesting that most people want some part of it to be true…as when they have been unsuccessful at change on their own so they just want someone to magically make them do what they know to be the right things automatically. But if the hypnotist using hypnosis was able to do that, then they would also be able to have that person do what the hypnotist wanted him to do for their own selfish needs. And that is what usually scares people, and rightly so. But the truth is that none of these remarks are true. Hypnosis is not a magic that takes over the subjects mind. So a hypnotist is limited to what their client or subject is willing to accept. An experienced and well trained hypnotist is able to get their client to accept more than others. From close to 15000 worldwide studies reported in the NIH database on March of 2009, when doing a search for “dangers of hypnosis” I was unable to locate any studies that distinctly cited that hypnosis was dangerous. Add to that the extremely low cost of malpractice insurance for hypnotists and you can come to the conclusion on your own that hypnosis is not the danger that some think it is. Rather, hypnosis is a helpful tool for quick and efficient change. The only dangers that I can see is in not taking advantage of hypnotic techniques because you were <i>afraid that it was</i> dangerous. Then Why Do People Fear Hypnosis? One of the things that make people hesitate to use the services of a hypnotist or to use self hypnosis is that they think that hypnosis is dangerous. Well in all cases, the answer to this question is that hypnosis is absolutely not dangerous. Part of what people seek when they are looking to use a hypnotist is to find someone who will make them do something that they can’t do or don’t want to do. Kind of like giving someone the power to make them into a zombie of sorts or Stepford wife. And this notion that they could have this kind of relationship with another person is what also scares them. Well the hypnotist can’t turn you into an unwilling participant in anything! The hypnotist can only help you with what you are willing and able to accomplish. Working with a hypnotist will help you to see, feel and act fully congruent with what you really want to accomplish. So there is no danger in seeking the help of a hypnotist or in using self hypnosis techniques to assist you in short or long term goals. As you weigh the dangers of remaining the same, doing the same unhealthy behaviors day in and day out, you can clearly see that they certainly outweigh any mythical dangers you thought you would experience from hypnosis or self hypnosis. Because there is no greater joy than being in control of your own destiny. Marc Carlin, leading authority on hypnosis to lose weight, co-author of the new book, “Real World Hypnosis – Insider Tips from Leading Hypnotists”, and articles about hypnosis. His work is found at his Hypnosis To Lose Weight website or his hypnotherapy smoking website. Are you tired of diets and weight loss treatments that are not working? Stop looking for them! The solution is right here! Use weight loss hypnosis! You will see that weight loss can be very effective when you put your unconscious to work. Reprogram your mind to lose weight without any effort by hypnosis. It seems easy, but it works! Losing weight is by hypnotherapy is a real success. Lose weight finally through hypnosis! It will help you lose weight in a safe and natural way, without any adverse side effects. Taking full control over your eating habits, you will start to lose weight slowly but surely. In addition, you will feel motivated to do more exercise and to eat healthy food for the rest of your life, even after you have reached the weight you want. People who use the hypnotherapy not only lose weight more than others lose, but they even feel great doing it, as they do not suffer because of deprivation or side effects from diets. Losing unwanted kilos, by weight loss hypnosis is simply the best way to feel great definitively, simply and easily. It will help you to discover the extraordinary way that will allow you to gain full control over your life and your habits. You know that you do want to eat exaggeratedly and you know that sport and a balanced diet are important to keep your balance and your health. However, these are thoughts of your conscious mind, and losing weight successfully is better related to your subconscious mind education regarding nutrition and metabolism. We all know that in order to lose weight we must do more exercise and eat less. Also, be aware that no diet works for long. Moreover, even the statistics show that all the diets have great chances of failure. Clearly, diets are useful to lose weight in the short term! Nevertheless, once you give up, your waistline is back or you put on even more weight than before. To maintain your healthy weight for a long term, you certainly need to change your way of thinking. Hypnosis is one of the most natural and effective way to lose weight because it acts on the level of the subconscious mind. Re-education of your unconscious mind and creating habits to feel good when you make healthy food choices, changes weight loss and maintains an ideal weight in an automatic, natural and free of effort habit. Hypnosis will help you re-program the way your unconscious mind relates to food. Weight loss hypnosis can make possible any diet that seems impossible because you will not have the same relationship with food as before. Hypnosis can work at the subconscious level to reschedule it, in order to help you reach a state of consciousness when you deliberately lose weight in an easy and natural way. At a moment when people seek the best solution to get rid of supplementary kilos, we propose a method of natural weight loss, which is fun, easy and actually works. Weight loss hypnosis is probably the healthiest way of losing weight if well integrated in your lifestyle and a well-organized program. Nowadays there is an extremely reliable method for losing weight, that is hypnosis. You will discover incredible techniques of weight loss hypnosis regardless the number of your kilos. Have you ever looked at yourself in the mirror and come to the realization, “Gee, I need to lose some weight”? Well you wouldn’t be the first, and you also wouldn’t be the first if you started a weight loss program that very day, only to have completely given up on it just a few days later. There’s a very simple reason for this, most people don’t go into weight loss programs in the right frame of mind to make it succeed. How do you get into this right frame of mind? Hypnosis! Hypnotherapy (the use of hypnosis for therapeutic means) has shown a great deal of success in helping people lose weight, and unlike most methods it actually results in long-term weight loss. It’s of no use to lose 10lbs over three months if you put it back on again soon after. Hypnosis works where other methods fail because it connects with the subconscious mind and places suggestions that work towards to achieve your goal, in this case weight loss. At this point you may be thinking, “I can’t afford to hire a hypnotherapist!”, and in this current economy that is more than understandable. 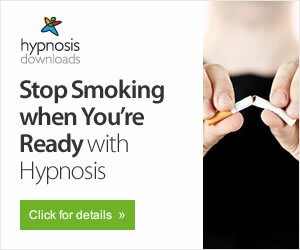 Fortunately the internet has brought forth an entirely new genus of hypnotherapy, the hypnosis download. You can now purchase a couple of hypnosis downloads, one focusing on weight loss and the other on exercise motivation and listen to them at your convenience. The beauty of this is that you only have to make a one time payment, and on most sites you can get this sort of package for around $30. Just imagine the inner-power that brings you. You are effectively commanding your subconscious, the most powerful part of the mind, to focus on sensible weight loss and regular exercise. That’s more than all the motivation you need to start dropping the pounds and become slim and healthy, and you’re not relying on any club, diet or “magic system” – it’s all coming from inside you! That in essence is what hypnosis is all about. It’s giving people the power to positively change their life in anyway they wish. When it comes to losing weight positive thinking really is what it’s all about. So as well as the regular use of hypnosis downloads there are a few simple tips I have for you that help keep you in that positive frame of mind. Weigh Yourself Once A Week – And only once a week! Choose a day and time and only weigh yourself then. While it’s tempting to monitor your weight loss extremely regularly it’s actually counter-productive. Your weight fluctuates throughout the day and speaking from personal experience I’ve seen my weight fluctuate by 6lbs, and I weigh around 150lbs. When some people see a fluctuation like this they think they’re gaining weight and that they’ve failed the weight loss program when in actuality it’s something that happens to everyone. Take Measurements – I’ve dealt with people who’ve been unhappy with the slow progress of their weight loss who have not even realised how much better they’ve looked just by dropping a few pounds. Good places to measure are the stomach, chest and thighs. Because exercise tones and strengthens muscle some people don’t lose as much weight as they originally wished by they lose many inches from around the stomach, chest and thighs because they’ve burned fat and replaced it with lean muscle by training and using training devices as an amazon foam roller to help with this. You can co-ordinate measuring with your weighing. Write Out Weight Loss Goals – And put them somewhere you’ll see them everyday. Split a piece of paper in two and have a section for daily goals and long-term goals. Your daily goals might be “Do 30 minutes of exercise” and “Eat 5 portions of fruit and vegetables”, these are relatively easy goals to achieve and as you tick them off each day you will feel successful. They will also help you achieve your long-term goals which might be “Lose _lbs this year” or “Get down to a size _ dress”. This sort of positive thinking and motivation will carry you through and make your goal of weight loss a complete success. One weight loss tip that isn’t so much to do with mindset but well worth mentioning is that you should take a good quality multivitamin once a day. This gets your body working at maximum efficiency and also greatly reduces cravings for food. Many people eat too much because their body is crying out for proper nutrients but the food they are eating isn’t supplying them with these. So they eat, and eat, and eat, not getting the nutrients they need but getting the excess calories. You now have all the information you need to make your weight loss program a total success. Don’t believe me? Take the first step and get yourself a weight loss hypnosis download and just watch as the pounds begin to melt away. I wish you the very best of success. Jake Rhodes is a trained counsellor and works alongside his brother, professional hypnotherapist Jon Rhodes. Together they have created a network of websites on the subject of hypnosis including the largest collection of hypnosis downloads on the internet. They have also made free hypnosis readily available online. If you have been to a brick and mortar book store near you recently, you would have realized that almost half of the best seller list are diet books or books that help people manage their weight. But did you know that there are million of people everyday across the country whose weight is out of control and are slipping into obesity? Does that mean that the latest diet fads do not work? Or does that mean that the people are just suffering from the side effects of a high-fat modern diet? If you have been chasing one of the latest diet regimes and have not had much success with it, it may not be your fault at all. In fact, Americans have spent millions of dollars on weight loss programs and diet books only to have them work for a while before gaining back all the weight that they have lost. If you are one of them, perhaps you should consider attending a weight loss hypnosis program. Weight loss hypnosis programs can be easily found on the Internet with cd programs which teaches self-hypnosis. If you need someone to coach you through the program, there are also a huge number of qualified hypnosis therapist to help you with your weight loss goals. But how exactly does hypnosis for weight loss work and why does it work? Well,this alternative weight management technique is not a new field. In fact, it has been used for many years by celebrities and other famous people to keep their weights in check. Weight loss hypnosis is best described as a state in which the individual is induced to “re-program” their behavior and thinking towards food, exercise and other activities that encourage healthy eating. The same techniques are also being used, with increasing frequency in recent years to treat people with smoking problems, sleep disorders, irritable bowel syndrome and pain control. The hypnotic state is a state of intense concentration in which you are totally relaxed and your subconscious mind is open to suggestions. This state is similar to being so absorbed in a good book that the world around you seems to fade away. Whether you are listening to a weight loss cd or working with a qualified weight loss hypnosis therapist, you will be guided at each step to relax and be induced into a hypnotic state so that the hypnotist can communicate with your subconscious mind with your help. So how does this process let you lose weight and more importantly, keep the weight off? This process of hypnosis for weight management works because it communicates with your subconscious mind. Your subconscious mind is the powerhouse portion of your brain that controls your emotions and feelings. Most of the time, people overeat because of emotions. This syndrome is more commonly known as emotional eating. It gets so strong that it defeats the logical thinking of the conscious, logical mind. They know what they are eating is enough, yet they cannot stop. That’s why the latest diet fads may get them to lose weight for a while but after that, they gain the weight back because deep down in their subconscious mind, the actions are still programmed to be locked into a “eat more to feel good” mode. Weight loss hypnosis can help you to control your cravings, to give you the added control to say no to those late night snacking sessions. It gives you the power to get to the root of your eating problem, your emotions and to re-program your behaviors to help you succeed in eating the right food and the right amounts of food. All these things add up to giving you the extra edge in helping you to lose weight and more importantly, keeping the weight off permanently, in a fast and “non-starvation” way. Alvin has been researching weight management programs for many years and have gained many insights in different hypnosis cds for weight loss programs. Find out more on his website at How does Weight Loss Hypnosis Work for more tips and reviews. Hypnosis is a word that describes a state of mind that allows new ideas, beliefs, and behaviors to be accepted into a willing participant’s mind without critical or judgmental scrutiny. This lessens the likelihood of rejection. So someone coming to see me, or any experienced and well trained hypnotist, with a desire to lose weight will be guided into this special experience where prior agreed upon suggestions will be presented for acceptance. During this time changes in perceptions will occur. Using emotions to trigger positive responses to the behaviors that produce weight loss will be installed. So that when the client eats the right kind of food in the right proportions they will feel powerful positive feelings. An effective hypnotist will also use emotions to trigger negative responses to the behaviors that have been keeping them fat or contributing to their unhealthy problems. So that when they look at foods they want to avoid they will feel powerful negative feelings that keep them from wanting to indulge in those unhealthy foods and/or behaviors. There have been many studies that have proven that hypnosis is effective when used to help people lose weight. One of those studies was made by a couple of doctors who used hypnosis successfully and did a review of other weight loss studies involving hypnosis. Their work can be found in Chapter 11, Hypnosis in the Treatment of Nutritional and Dietary Problems. Clinical Hypnosis: Principles and Applications by Harold B. Crasilneck, Ph.D. and James A. Hall., M.D. What Should I Look For In A Hypnotist Assisted Weight Loss Program? Each hypnotist approaches their clients, and their client’s problems in their own unique way. The more successful hypnotists require their clients to commit to making the changes and commit to a series of sessions. It is quite clear that the best weight loss programs are designed around a support system, and an experienced and well trained hypnotist will view their work in the same way. The series of sessions act as a support system for weight loss clients as they build the new behaviors and responses into their lifestyle. You probably already know that habits are what make our lives easier. Habits help us to do repetitive tasks without thinking, so we can focus on what really needs our attention during our normal day to day existence. With any change in lifestyle we are looking to develop habits that make it easy for us to maintain and continue this lifestyle. So as we develop the habits of a healthy and fit person they become who we are. So where do you find a fast weight loss hypnosis center. No doubt you have heard of the treatment options, but you may have never actually attempted to find a hypnosis center that offers such a service. One of the best places to start is the internet. You will find many hypnosis web sites to choose from. Unfortunately all hypnotists are not created equal. There is a big difference in what each center has to offer. Here are some other things to look for in making the right decision. How long has the hypnotist been in practice? What kind of results do they have? If you are looking to lose weight quickly, to they have proved of fast weight loss. Everyone seems to say there programs are proven effective but you really need to see a preponderance of evidence before and after photos, line endorsements, which includes first and last names, city and state. So often times you will see Jb Chicago, Illinois, this is not believable. Fast weight loss is a mindset. Your hypnotist has to help you understand that not only is it possible but it is something that happens on an ongoing basis. Sometimes it is left up to the client as to how fast they lose. They could be given suggestions, that they didn’t put the weight on over night so why would they think that can lose it quickly. Some might be told they can lose at their own pace. Those kinds of suggestions will produce slow weight loss. Other things you may want to consider in searching for fast weight loss are; does your hypnosis center offer a free consultation to come into the office so the hypnotist can get some background information and test to see if you are a good hypnosis candidate? Do they offer an ongoing support system? Are there services available if you regain your weight? Are they a member of the Better Business Bureau? In order to be comfortably hypnotized, you have to attend sessions in an environment that is fun and exciting. Most people have been programmed to believe that fast weight loss has to be hard, difficult and pure non-stop drudgery. Nothing could be further from the truth. Losing weight with hypnosis can be fast, easy and exciting. With effective programming, losing weight can be one of the easiest things that you have ever done. You can spend some time surfing hypnosis websites and find the one that you feel would fit your needs as well as your budget. Doing some research can go a long ways in helping you find a fast weight loss specialist. Think about how much time you spent on researching a new car, or planning a vacation. So hopefully, you have some good guidelines in finding a hypnosis center that specializes in fast weight loss. Do you homework, send some e-mails, make some phone calls. By doing your research you will have a better chance at finding a hypnosis specialist. Your body and mind depend on it. Good luck with you weight loss experience. Robert Hudak has been a Certified Hypnotist for twenty fives. Before and After pictures of customers who have accomplished fast weight loss are available. Download your FREE copy of “Top 7 Fast Weight Loss Cheats & Shortcuts” today! Many people who have not done well at weight loss hypnosis programs usually do not have a good picture or have a realistic expectation of what the hypnosis therapy session can bring to them or what it can help to do to their bodies. It is those same bunch of people who thinks that their years of accumulated fat in their body will just disappear with just one session of hypnosis for weight loss program. Going into such a program without a realistic expectation will most certainly cause the program to fail. No matter you are taking up a new diet program or a gym routine, you need to know what exactly the program is going to do for you and how long it takes and what are the milestones that you can measure against so you know you are making progress. Taking up a weight loss hypnosis program thinking its a miracle pill is foolhardly. However, if used correctly, the program will give you the extra edge in gaining control over your weight. Engaging a good qualified hypnosis therapist will be tremendously helpful to you. One of the advice that they will give is that weight loss hypnosis is not something that you can use by itself, in that you cannot simply “think” your pounds away. If it was that simple, there would not be a need for the existance for gyms and diets. Does that mean that weight loss hypnosis is useless ? Nothing can be further from the truth. Modern hypnosis techniques has been used and perfected over hundreds of years. They are used to build self-confidence, change and modify habits, stop smoking problems, improve memory and of course, helping people lose and manage weight. Many people who have picked up a diet or gym routine initially finds that their weight may be dropping slightly. They get so happy and lose their head and starts to overindulge in food again and their weight shoots back up. This cycle continues on and on, and they continue picking up new diet and exercise books to try it out, without realizing that the cause of the weight problems is in themselves. Weight Loss Hypnosis complements your diet or gym routine by modifying the self-defeating thoughts hidden deep in your subconscious mind. It is in your subconscious mind that your feelings and emotions are kept. Many studies have shown that feelings and emotions are almost always stronger then logic. That’s why sometimes you know you should not be eating but then you “can’t help” but eat it anyway. All our habitual and behaviour controlling our thoughts resides in the subconscious mind. During a hypnotic session, a qualified weight loss hypnosis therapist will induce you into a relaxed, hypnotic state. Then the therapist will attempt to “re-program” your habits and inner thoughts to make you more aware of what you are eating, how much you are eating and how to control your appetite in a safe and natural way. However, going for a hypnosis session is not the means to an end. For you to gain the most out of your hypnotic weight management sessions, the motivation to change must come from within you. Hypnotic suggestions should be repeated on a regular basis until you notice a change. You can either go for regular hypnotic sessions or you can purchase hypnotic cds for weight loss so you can listen to it every day till you notice a change. The key to succeeding relies on you wanting to change. Weight Loss Hypnosis may sound tedious at first, yet, if done correctly, you will realize that suddenly you can follow any diet or gym routine that you have picked up for yourself without forcing yourself through it. You will learn to enjoy the diet routine because of your changed mindset towards food. No longer will you have uncontrollable cravings or overeating sessions. No longer will you skip your gym sessions because you are tired. The hypnosis programs re-programs your thoughts and habits to make following your diet and gym sessions a second nature to you. This re-programming of thoughts and habits is even more important then just simply losing the weight because this is the part where it keeps the weight off for the rest of your life. Hence, weight loss hypnosis is a powerful tool in helping you combat your weight management goals and it is a formidable partner in complementing any of your diet or exercise programs. Alvin has been researching weight loss hypnosis programs and runs a weight loss hypnosis website which has reviews, information and cds. Weight loss Hypnosis is one of the best methods of reducing weight. As there is no side effect with the use of hypnosis, this method is highly recommended by physician all over the world for the treatment of obesity. There is no need for dieting with the use of hypnosis for the control of overweight. In weight loss hypnosis method of weight control, the doctors and the therapists work together to bring weight loss. In the hypnosis method, hypnotists are better trained to bring the weight loss in overweight person, the knowledge of hypnotists is better than that of psychologists. Hence hypnotists are preferred over psychologists. Hypnotists doing hypnosis must be certified by the hypnotists’ organization. Overweight is determined by the body mass index. If the body mass index of an individual exceeds forty, it is better to consult a hypnotist for the treatment of obesity. On consulting hypnotists for the treatment of obesity, the hypnotists will examine the various factors attributing to weight gain in overweight person; the various factors are the eating habits of the individual, and the mood swings of the individual. The hypnotists completely study the feeling of the individual and prepares the individual for the weight loss hypnosis session. Those with some attitude which is skeptical are very difficult to hypnotize by the hypnotists. Cooperation of the individual undergoing hypnosis is essential in carrying out weight loss hypnosis. Positive attitude of the individual undergoing hypnosis is essential for the positive outcome of the hypnosis method. In the weight loss hypnosis method of weight reduction, the individual has to undergo a week of hypnosis session; the hypnosis session has to be carried for about six times for the better outcome of result. The outcome of the hypnosis method is affected with only one session of hypnosis method. Only a few session of hypnosis method will give better results. The person undergoing hypnosis method has to periodically call hypnotists for appointment and the hypnotists do hypnosis on the individual for weight loss. Certain types of audio products are available in the market for the various functions of the body such as concentration of an individual can be improved with the use of this audio product. Global hypnosis is one of the audio products designed to reduction of weight by using the weight loss hypnosis method. In this audio product, sound therapy is used in conjunction with self hypnosis. By using this products, all the muscles in the human body can be relaxed, there is also in the flow of blood, increase in the flow of blood increases the concentration of the individual. By sound therapy, blood pressure is regulated. Enormous health benefits can be achieved by stopping smoking. In self hypnosis, a voice which is mesmerizing is used to do the hypnosis. All natural sounds are mixed in this method; natural sound of rain gives a soothing feeling to the listener. In sound therapy, a sound track is used to relax the listener, the sound tract played for a period of 30 minutes. In this sound therapy, specific sounds are created to give the listener a soothing feeling. This sound therapy increases the mental consciousness of the individual. Weight loss hypnosis can be done to reduce the weight of an overweight individual. If you need more information on the top weight loss products. Please visit us below.